- Dramatic consumer recognition improvement with multi colored rings around the cord instead of along the cord. - The ends of the cord being of different colors also allows for quicker identification when unrolling and detanglement. - Company or school colors can be used as well as LED lighting incorporated with the cord. - A pioneering branding strategy for a company to increase sales and for the ease of consumers to identify an extension cord on store shelves that will stand apart from all competitors. - Improve sales relationships with schools or businesses by customizing cords with school or company colors; which would be a security feature against theft. - The color scheme and marking method assists users to identify and detangle the cord as quickly and efficiently as possible by being able to see a starting point verses confusion over where to start untangling from. - LED lights can be used for cosmetic appearance or a safety feature if used in traffic areas at night. This was developed with the help of middle school junior cadets. A % of any purchase or royalties is recommended as a donation to the school. This item has never been marketed or sold. The potential is immense since it is a pioneering design application. In fact, my understanding from industry leaders indicate they do not have the technology to apply the coloring application yet. Sounds like another great invention challenge. No trademark or website initiated at this time. 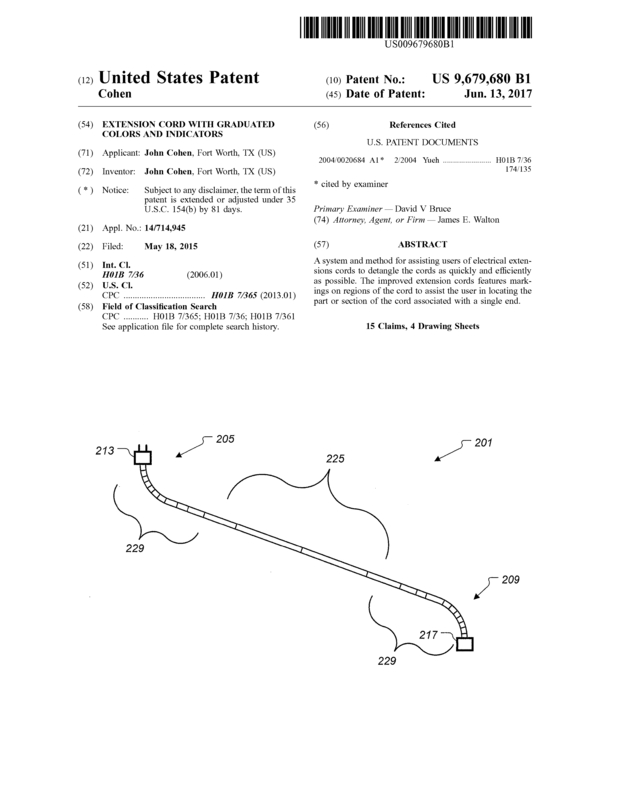 Page created at 2019-04-23 6:45:47, Patent Auction Time.